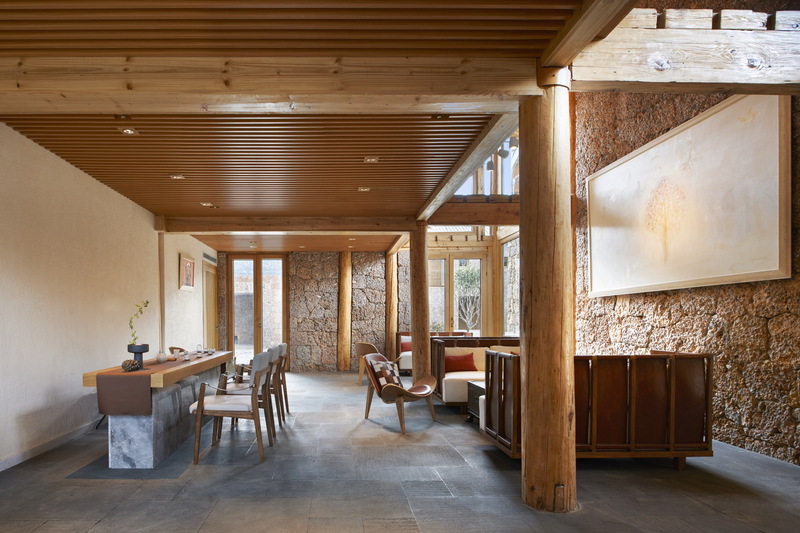 Young architect Yoshimasa Tsutsumi planned the functional conversion of a neighbourhood in Baisha, in the village of Yuhu in Yunnan province. 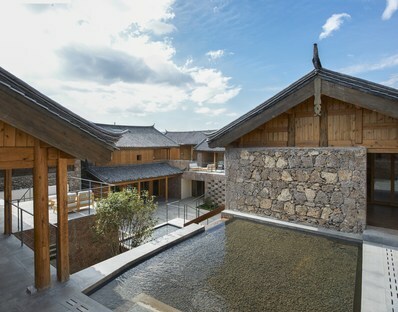 Tsingpu Baisha Retreat is the result of Tsutsumi & Associates’ attentive mediation between the old and the new. At the foot of the mountain symbolically known simply as Jade Dragon Snow Mountain stood a group of houses of the Naxi, a Chinese ethnic minority group that still maintains independence in the Lijiang and Yunnan Regions. The desire to preserve this testimony of the past, which still constitutes a strong link for people with their family and local history, encountered the need to evolve in the present. Like many more traditional parts of the interior of China, Yunnan province is fighting migration away from the countryside by offering incentives for tourism, primarily luxury tourism, in discovery of little-known places which still preserve some traces of the past. 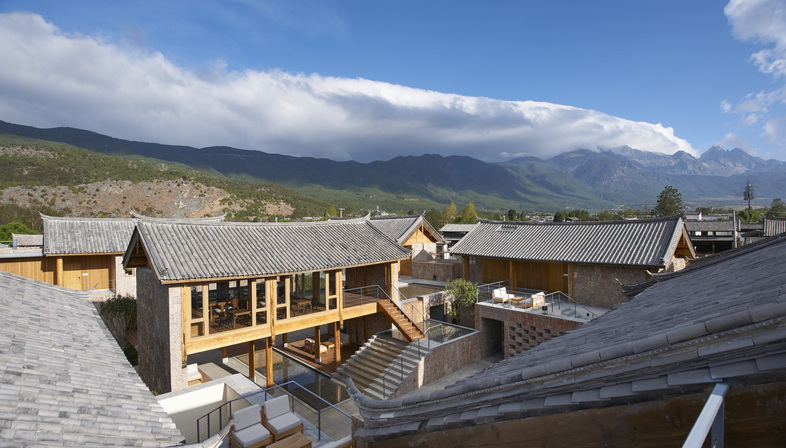 Traditional homes are converted for use by tourists, providing shelters and refuges surrounded by the spectacular natural surroundings of the region of Jade Dragon Snow Mountain for visitors fleeing the frantic pace of city life. It has become common to restore historic homes, preserving them and redesigning them in response to the demands of hospitality today. In the case of the Baisha site, the old buildings were four homes with pagoda roofs, built out of timber and local Wuhua stone, arranged to form a sort of original circular core. These buildings have been preserved, restoring the stone outside walls, the roofs and the pillars, which are used to support new timber structures, and others have been constructed around them, clearly demonstrating that they were built at a later time in history. 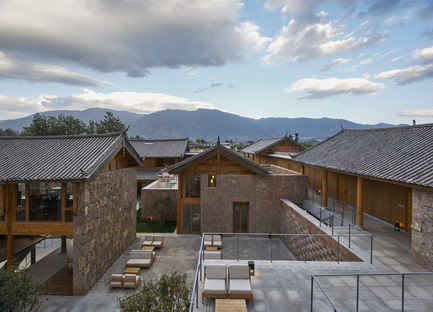 The new outlying buildings feature the same stylistic features as the Naxi homes, with trapezoidal stone masonry, reconstructing a sort of “opus incertum” of more uniform disposition, clearly distinguishing between the original constructions and the new ones while achieving figurative continuity. Old and new volumes, isolated from one another, form interstitial spaces filled in with gardens, bodies of water and terraces on different levels, simulating the urban stratification of a village that has grown over the years. The new constructions are surrounded by stone walls one floor high, beyond which we can see the alternating stone and timber of the two-level constructions within. The massive stone masonry alternates with timber frames, describing external arcades and inner structures filled in with glass walls. The idea of permanence conveyed by stone contrasts with the temporary nature of the timber structures, alternating gravity with lightness in a project that is enriched by its use of differences. The gateway to the area, with its traditional pagoda roof and monumental appearance restored to its ancient splendor, is one of the remnants of the original structure. When seen from the outside, the site now looks like a fortified citadel, with the volumes of the old and new houses rising above it like towers: a district within a district, a circumscribed system that relates to its surroundings through restoration of the ancient Wuhua stone. On the inside, however, is a whole different world, inspired by modern western standards of comfort. 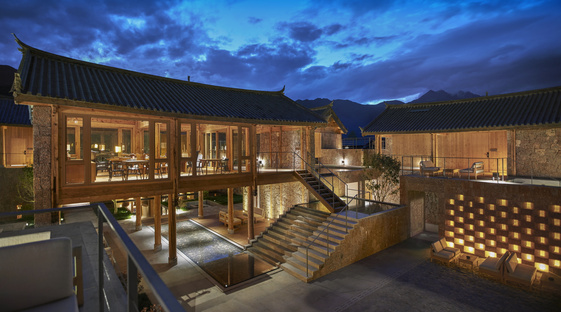 The rooms in the resort, set up in the new timber volumes with big windows and large arcades, become a belvedere over Jade Dragon Snow Mountain and from the perspective of a cosy, sheltered, comfortable place. The contemporary and the ancient fit together in a new place which will definitely attract interest to local history; only time will tell if such for-profit experiments have the power to revitalise the society that continues to live outside of them, the Baisha district and Yuhu village.